Your favorite beverages will be served hot and in style when you pour them into this stainless steel carafe. Thanks to the double-walled design, this thermal jug helps to keep hot beverages hot and cold beverages cold for up to 24 hours. Just fill the jug with coffee, tea, hot chocolate, water, or lemonade and then use the stainless steel handle and the lever-operated top lid to serve drinks to your guests. And thanks to the gleaming red finish and the silver-tone accents, you'll be serving up style as well as refreshments. 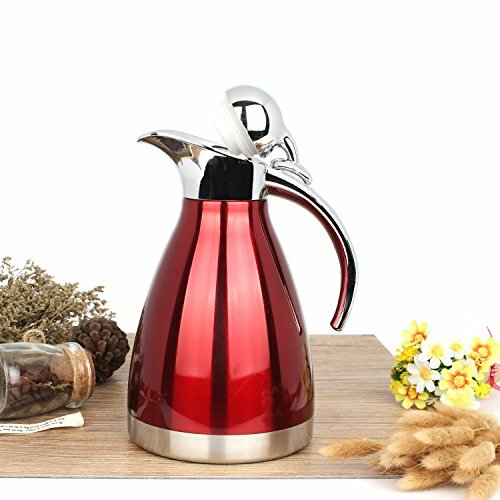 Approximate Dimensions (in inches): 6.5 W X 11.5 H X 5.75 D.
A thermal serving carafe featuring a stainless steel structure and a red finish. The double-walled design helps keep up to 2 liters of liquid either hot or cold for up to 24 hours. Comes with a handle and a top lid that can be opened with ease by pressing a thumb on the lever.